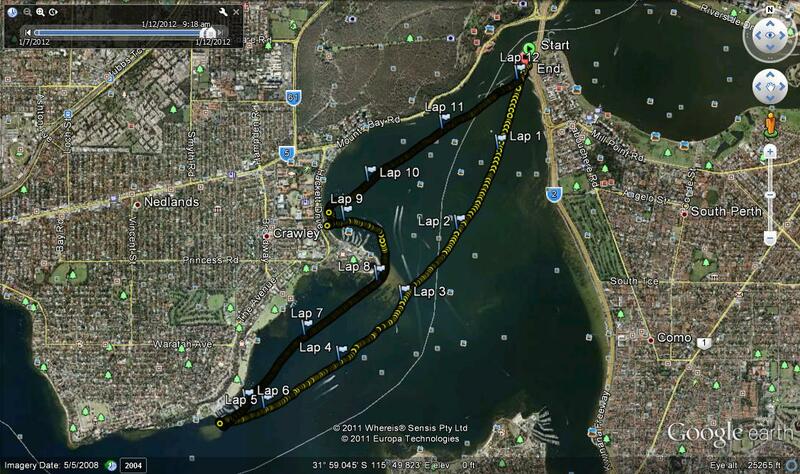 The Narrows to Dalkeith and return, 12.1 km, 1 hour 36 min. Wind Easterly at 12-15kts. Something about the best laid plans of mice and men? The plan had been to paddle from the Narrows to the Fremantle bridges, and when we intrepid paddlers put in at the Narrows it was looking good. You could tell it was building up to be a scorcher, and the promised Easterly just wasn't there. Westy, M4P and I were joined by James - fresh from a couple of years at Gorilla Biscuit Pty Ltd HQ in Canberra, where he had been the fire warden. James had just driven across Australia with his sea kayak strapped to the roof and sheathed in multiple layers of Glad Wrap - not unexpected given his fixation with the movie Bad Boy Bubby. I suppose we should be thankful that it wasn't a cat that he had Glad Wrapped on the roof ("Be still!"). Not James' sea kayak on the roof. We had only paddled for about a kilometre or so when the Easterly came in, and pretty soon we were having heaps of fun surfing our way across towards Nedlands, making good between 10-11km/h. Unfortunately, we lost touch with M4P shortly afterwards and he was spending all his time trying to stay in his Spirit PRS. We had just naturally assumed that he would make a beeline towards Heathcote before turning due West, but instead he was making for the nearest land, near UWA, where it is very shallow. Westy turned and headed over on a rescue mission, but James and I kept going, and surfed our way over to Beaton Point, before we stopped and decided that we should show some concern. Going back around the Nedlands Yacht Club we finally caught sight of the other two rounding the spit towards Royal Perth Yacht Club. It was a bit of a hard slog paddling into the wind, but we finally caught them at Royal Perth before we paddled back to our launch point, the wind all but having disappeared by the time we got there. I felt good after the 12km, and could have easily paddled another hour. The down-wind run, which the Mandurah Duel is designed to be, was quick. Having left two of the four cars near Zephyr Cafe in East Fremantle, it made sense to eat there as well, and after a drive-by to pick up the wounded antelope, off we went. This shot is flogged from their website. Sorry! I have to say at the outset that I like Zephyr - its been pretty much our default setting from breakfast for some time now. The menu is good, with both standard and left-of-centre choices, the prices very reasonable and the location is without peer. It gets a pretty mixed write-up on some of the review websites, but we've never had a problem. Something that never happens on a Saturday paddle is getting the best seat in the house at Zephyr afterwards, but this being a Thursday, we did. Ordering at the counter, as you do at Zephyr, James and I had the Green Eggs and Feta ($16) with a side of bacon ($5), whilst Westy had his customary Eggs Benedict ($17) with a side of mushrooms ($5), and M4P went the Big Breakfast ($21). The Green Eggs and Feta were pretty good. Stirred through with basil and having sizable chunks of feta, they are served with two slices of thick, chunky toast (which sits on top of the two sachets of butter that you need to find quickly, before they melt!). The eggs were creamy and the balance of basil just right. There was enough there to feed a hungry paddler even without the side of two very big, thick rashers of bacon that sat adjacent. In fact there was so much on the plate that I couldn't get through it all. Westy was happy with the Eggs Benny, and there is no greater praise than that, and M4P couldn't get through his Massive Breakfast either. Zephyr's coffees are always good, never bitter and always at the right temperature and it was no different today. James smashed in another as we sat out on the patio, a single step away from the beach and in the shade of two palm trees, contemplating the world and the impending shock of smashing my face back into the dough tomorrow morning. I think it was that shock that drove a short conversation on retirement and superannuation, that finished with a melancholy "Only 19 and a half years to go..." But nothing could take away the magnificent view that we had sat down to. And that's a good way to finish a paddle and breakfast. Like I said, best table in the house! Although Tommy did not actually require a rescue, and was quite put out that we stuck with him rather than abandon him to his own itinerary, we wouldn't have it any other way. Social paddlers only on the way to breakfast. BTW, thanks for the trial of the PRS! I could get quite used to that ski. I understand they are in high demand around the streets and carports of WGV. Blue, I love your Blog and am enjoying following your paddling exploits. Good luck in the Duel. Ive decided not to enter as too much time training at the moment risks an unhappy wife. P.S. Good to see you've added a link to Emma Watson's site! Thanks mate. Only a few doing the estuary run in Mandurah - might be a pretty lonely paddle. Emma and Nigella will motivate me to finish.